They replied, ‘Five gold tumours and five gold rats, according to the number of the Philistine rulers, because the same plague has struck both you and your rulers. 5 Make models of the tumours and of the rats that are destroying the country, and give glory to Israel’s god. Perhaps he will lift his hand from you and your gods and your land. 6 Why do you harden your hearts as the Egyptians and Pharaoh did? When Israel’s god dealt harshly with them, did they not send the Israelites out so that they could go on their way? 10 So they did this. They took two such cows and hitched them to the cart and penned up their calves. 11 They placed the ark of the Lord on the cart and along with it the chest containing the gold rats and the models of the tumours. 12 Then the cows went straight up towards Beth Shemesh, keeping on the road and lowing all the way; they did not turn to the right or to the left. 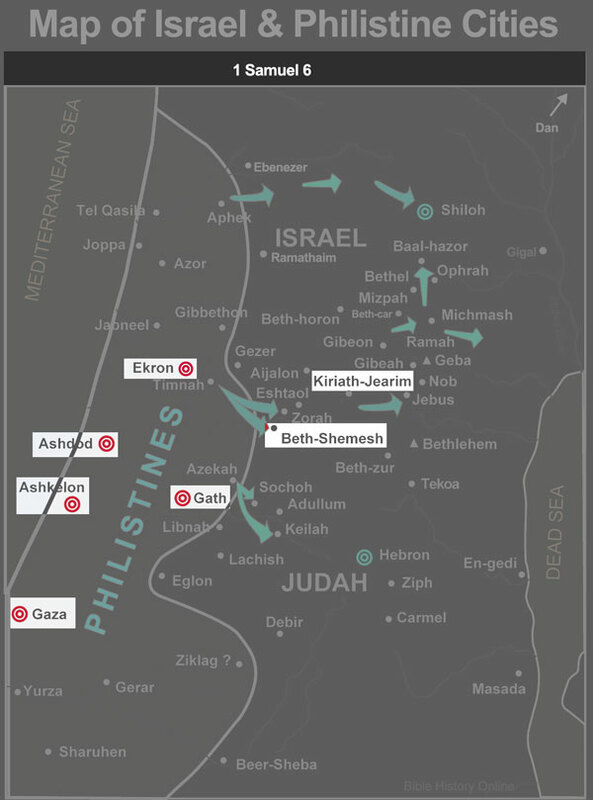 The rulers of the Philistines followed them as far as the border of Beth Shemesh. 17 These are the gold tumours the Philistines sent as a guilt offering to the Lord – one each for Ashdod, Gaza, Ashkelon, Gath and Ekron. 18 And the number of the gold rats was according to the number of Philistine towns belonging to the five rulers – the fortified towns with their country villages. The large rock on which the Levites set the ark of the Lord is a witness to this day in the field of Joshua of Beth Shemesh.